Yesterday I installed Windows 10 to start doing bug hunting and experimenting on what will be the next version of Windows for every device. As I posted yesterday, Windows 10 is certainly in beta and shouldn’t be installed on your production (day-to-day) PC unless you are willing to put up with odd behavior and bugs here and there. In my case, I installed it on a PC I do not use every day so it can be my test bed. This post will be the first in a series that outline the updating and development of Windows 10 until it is released later this year. For this first part, I’ll cover the installation process and my first impressions. As a reminder, for those who want to try Windows 10 out yourself, you can do so by joining the Windows Insider program. It is free to join but the expectation is you will test and help report bugs. Also note that for you Windows Phone users, Windows 10 for Phone will not be available until February. Right now it is only for PCs and tablets. My Windows 10 test PC is actually a Apple Mac Book Pro 13″ 2013 edition. After my complete dismissal of Apple products from my life back in August, I used the Boot Camp tools to completely reformat my Mac Book and only had Windows 8.1 installed on it. There is no OS X on this laptop but I will tell you that a MacBook runs Windows amazingly well. That said, there are some obvious limitations to installing this on a Mac Book Pro versus a PC. First, the touchpad generally doesn’t recognize side swipes which is fine in Windows 8.1 as you can just scroll over to the Charms and get to the Start menu, etc. Charms is gone in Windows 10 so that makes navigation a bit more difficult. Also, some of the Boot Camp keyboard translations just don’t work in Windows 10. For example, in Windows 8.1 to take a Print Screen, you would press and hold Fn+Shift+F11. That doesn’t work in Windows 10 for whatever reason. I’ve done some experiementing with some other apps to try to capture some screenshots for this post but I’ve not been successful yet. A work in progress. As I already had Windows 8.1 installed on this PC, I simply followed the upgrade process outlined on the Windows Insider website. Essentially the upgrade process leverages Windows Update to download and install the new Windows on top of Windows 8.1. There is a way to get a ISO image of Windows 10 if you want to do an absolutely clean install but given that a very high percentage of people will be installing Windows 10 via the upgrade process, that was what I wanted to experience for myself. The use of Windows Update is how Microsoft plans on delivering Windows 10 and subsequent updates to the masses and part of the whole “free upgrade in the first year” focuses on the fact that the update has to be done via Windows Update. The upgrade was amazingly simple and after three reboots and about 20 minutes I was up and running. There was no great mystery to it and there certainly wasn’t any drama. After doing a few trial reboots I found that Windows 10 didn’t take any longer than Windows 8.1 to book on my MacBook Pro and overall performance is about the same. After installing Windows 10 I ran through a wide range of apps and processes to see how it performed. Frankly it was flawless. I had no crashes, no odd behaviors in running Office apps, Internet Explorer and various other Windows 8.1 apps. If anything performance was better when it came to opening applications and when I had multiple applications running in the background. Windows 10 does manage processes better than Windows 8.1 and that shows already even in this early build. combined. You can take this and make it full scree if you want just like you can with Windows 8.1 today. I fully appreciate I may have been one of about 4 people on the planet that actually liked the modern Start screen but equally there were times where I missed the simplicity of the Start button. This is the best of both worlds and I like it. One thing that I did notice was that my current Start screen in Windows 8.1 was not translated into the new Start menu in Windows 10. It was blank when I booted up for the first time. I suspect this is a beta bug type thing but if you are planning on updating, be prepared. Adding things to the menu is easy as finding the app on the Start menu, right-click and Pin to Start Menu. notebook on my PC like I do on my Windows Phone and all of that information is synchronized. 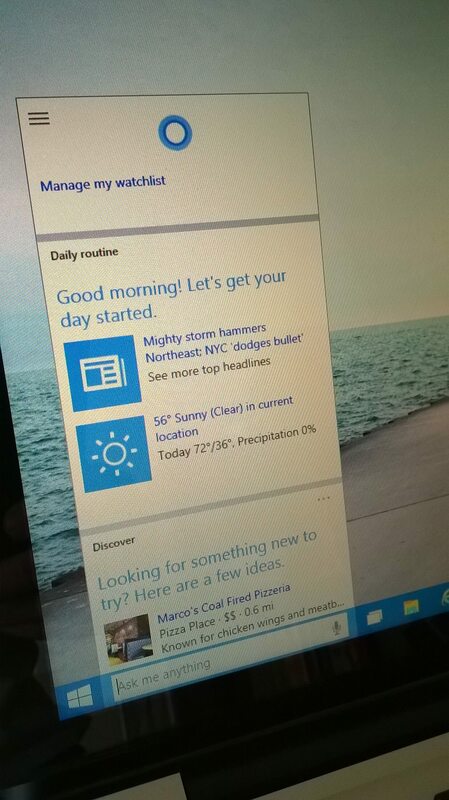 At this point I would say that Cortana is more of a parlor trick than a digital assistant in Windows 10. I do not however expect that to last long and hopefully by the time we get to February and a new build there will be marked improvements. As I’ve said many times, Windows 10 is in beta so bugs are to be expected. The biggest one I’ve found so far is when you do a Cortana search. You get back random letters and numbers for the names of your search results. Strange but given how Cortana is in her infancy on the desktop, I’m not overly surprised. I’ve also noticed a few artifacts when switching between apps from time to time but nothing major and generally a minimize/maximize solves it. This to me feels like a video driver issue which, again, isn’t optimized for Windows 10 just yet. 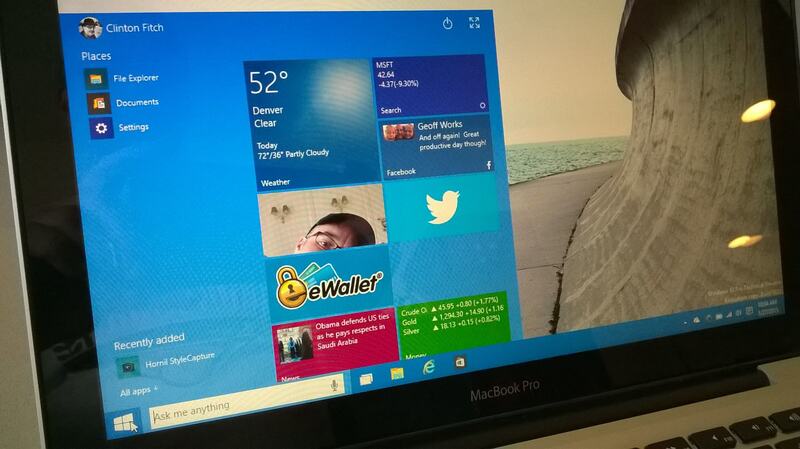 Overall I’m impressed with what Microsoft has delivered in this first beta of Windows 10. It is very solid and performance seems to be at least as good as Windows 8.1 and better the more you load onto the system in the way of open apps. There are certainly bugs and issues but nothing that I’ve found that is a complete show stopper. You can see the beginnings of what is going to be an awesome experience in Cortana but there is still much maturing that needs to happen on this service. I will repeat myself One. More. Time. Windows 10 is not ready for prime time but it is absolutely going to be a game changer when it is available to everyone. Microsoft has smoothed out a lot of the oddness of Windows 8.1 and truly seem to be driving toward their goal of Mobile First, Cloud First.